Terry has a broad background in the chemical industry. His career includes Head of Corporate Purchasing for Alfa-Inorganics, Beverly, MA where he managed the procurement of over 5,000 different chemical compounds, ranging from precious metals to refractory compounds. 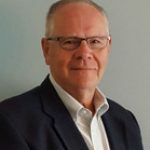 He later joined Apache Chemicals, Inc. as the U.S. sales manager, where he was responsible for establishing the company’s strategic marketing and sales plan. Under Terry’s leadership, Apache sales increased annually by an average of 45%. Terry’s experience and success in this industry lead him to start his own company. In 1980, he founded Aran Isles Chemicals, Inc. Aran Isles focus was on custom synthesis, formulating specialty compounds for multiple applications, including defoaming chemicals, ceramics, optics, pharmaceuticals, and crystal growth over a broad customer base, including Bell Labs, Lawrence Livermore Labs, Sandia Labs, Los Alamos Labs, IBM, G.E., Sigma-Aldrich, Bayer, and Eli-Lilly. Terry has a degree in Business Administration from AIB Lynn, MA where he graduated with Honors. He also served our country for six years with the United States Marine Corp.
William L. Emkey, Ph. D.